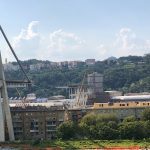 The Morandi Bridge, a 50-year-old structure that was part of a highway system connecting the city of Genoa in Italy to France, collapsed on Aug. 14, 2018, during an intense rain storm. Dozens of vehicles fell onto a riverbed, railway, and two warehouses below the bridge, causing significant physical damage. More than 40 lives were lost. 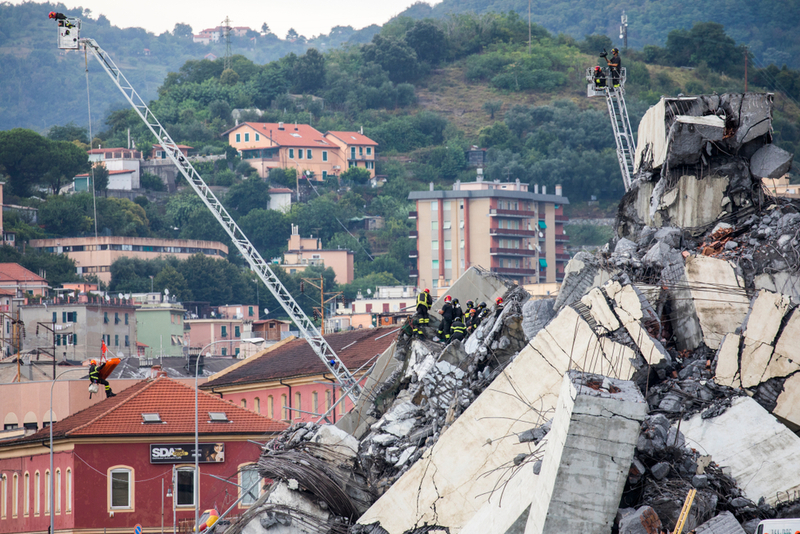 Check it out: Security camera footage documents the collapse of the Morandi Bridge. While experts continue to investigate the reasons for the collapse, many people have theories about why the structure came down. Like many bridges across the globe, there were signs that the Morandi Bridge could fail. 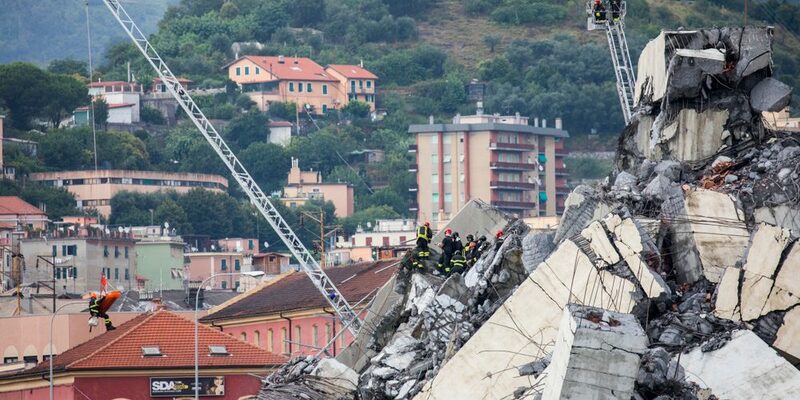 In this article, we’ll share some of the warning signs experts saw prior to the Morandi Bridge failure. This could help bridge managers identify issues with other structures and prevent future calamities. This important connector, completed nearly 50 years ago, was named for its designer, Riccardo Morandi. It was a cable-stayed bridge, which means sections of the roadway were cantilevered from towers and supported by stays. This design is generally considered a cost-effective option for mid-sized bridges. 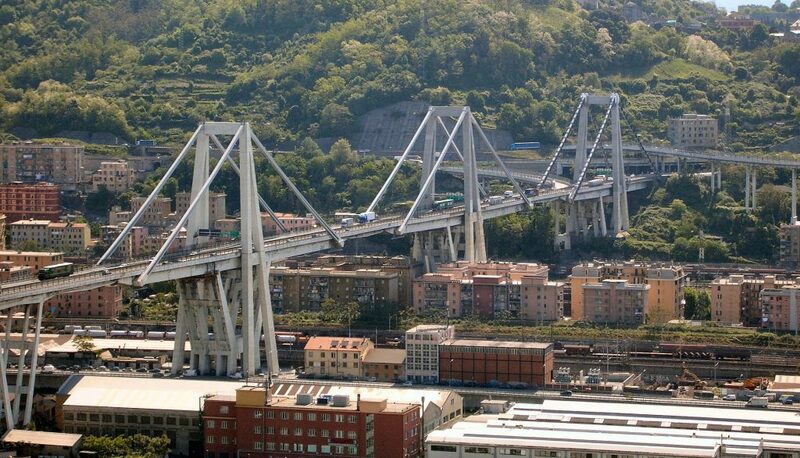 The Morandi Bridge prior to collapse. Notice the significant amount of infrastructure beneath it. Cable-stayed bridges are more common today than a half century ago, when they were a relatively new concept. The Morandi bridge was somewhat unique because the stays used on it, which are critical for supporting the structure, were made of concrete reinforced with steel tendons. Adding steel enables the concrete to handle the bending and stretching that comes with supporting a roadway. This type of construction is no longer common. Newer bridges of this type use steel cables, which are more flexible, stronger, and more durable than reinforced concrete. Sections of roadway are cantilevered from towers and supported by stays. This is important because the Morandi Bridge did not have the redundancy built into it that today’s structures do. While it has not been determined that the number of stays was a contributing factor to the collapse, a bridge with multiple stays per section is better able to survive should one fail or become stressed because of a shift in load, accident, or extreme weather event. 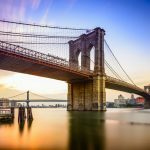 By studying bridge failures, engineers have learned that adding structural redundancy can help prevent what’s known as “the domino effect.” This happens when damage to one bridge component causes others to fail, much like when one domino knocks down others positioned near it, turning into a chain reaction. Construction. Reports say work was being done on the bridge’s foundation at the time of the incident. Instability at the foundational level could have caused or contributed to the collapse. Design and construction errors. Since the bridge opened, experts have suggested the original design was flawed. Many believe the calculations used to determine how the concrete would age and perform over time were inaccurate. On top of this, lesser-quality materials may have been used because of budget limitations and cost overruns. This made the concrete prone to cracks, water damage, and corrosion. 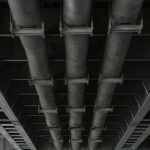 A similar Morandi-designed bridge in Venezuela has required a high level of ongoing maintenance to retain the structural integrity of the concrete. Weather. The event took place during an extreme summer storm. While many dismiss this as the ultimate reason for the collapse, wind, rain, and higher water flow could have exacerbated other issues. Increased traffic. The Morandi Bridge was built at a time when the area around it was less densely populated and traffic volume was far lower than the current 25 million vehicles per year. Many experts have expressed concern about whether the bridge could handle the extra wear and tear and the weight that comes from increased traffic volume. Weight. Traffic is not the only factor that adds weight to bridges. Decades of repairs, structural enhancements, and repaving can as well. There are reports that the bridge had undergone significant maintenance work over the last few years that could have stressed it beyond its limits. Age. Many bridges built during the 1960s are reaching the ends of their useful design lives. Longevity was not a consideration during the road and highway boom of the time. Some experts say the Morandi had another half-century of life in it, while others claim it faced many of the same issues as structures that are aging out. Privatization. The Morandi was owned and managed by a private entity, not a municipal government agency. 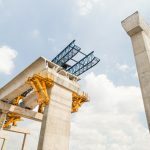 While the owners completed required inspection and maintenance work, they may have not had adequate funds to upgrade the bridge to withstand current demand and meet today’s design standards. Infrastructure issues. Similar to the United States and many other countries across the globe, infrastructure spending in Italy has been inadequate for decades. This likely contributed to the structural decline of the Morandi Bridge over time. Accident. Although no accidents were reported at the time of the failure, it is possible that an impact on the roadway or to the foundation below could have triggered or contributed to the collapse. 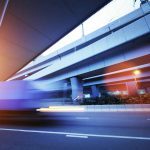 Have you thought about how bridge maintenance and construction work could affect structural integrity? These activities can weaken bridges or add weight they weren’t designed to handle. Extra planning can help prevent unintended consequences. Have you upgraded bridges to eliminate design flaws and meet current design standards? 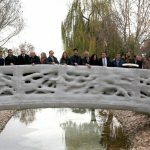 Modern materials, design software, and modeling capabilities have contributed to making bridges lighter, stronger, and safer than ever before. Have you considered the impact of climate change and related extreme weather on bridges? Most older bridges weren’t built to handle stronger winds, major shifts in temperature, more powerful water flow caused by flooding, and wildfires. Consider using fire blankets to protect bridge infrastructure from fire and extreme heat damage. 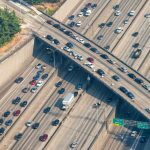 Is it time to upgrade bridges — or build additional ones — to handle higher traffic loads? Traffic in most areas increases incrementally year over year. After several decades, traffic levels could exceed the levels that structures were designed to handle. Have you checked that current load levels are sustainable? Decades of repairs and enhancements could stress certain sections of bridges beyond what they can handle. Consider replacing old structural additions with new ones made from lighter modern materials, like under bridge utility support systems. 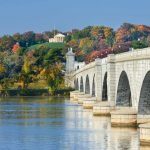 Is it time for a major bridge rehabilitation? Like many structures built after World War II, bridges from the period weren’t designed to last forever. It may be time to commit to a complete overhaul or replacement. If you can’t secure funds for a renovation or rebuild, inspect bridges regularly for cracks, damage, or unexpected structural changes. Modern lifts can help inspectors and engineers get to hard-to-reach areas of antiquated bridges. What entities should own and manage bridges? The answer is: It depends. If a municipality is cash-strapped, it might make sense to explore alternative private funding sources. If public safety and security is a top priority and private funding isn’t a possibility, ensure municipal agencies have the resources necessary to maintain structural integrity. 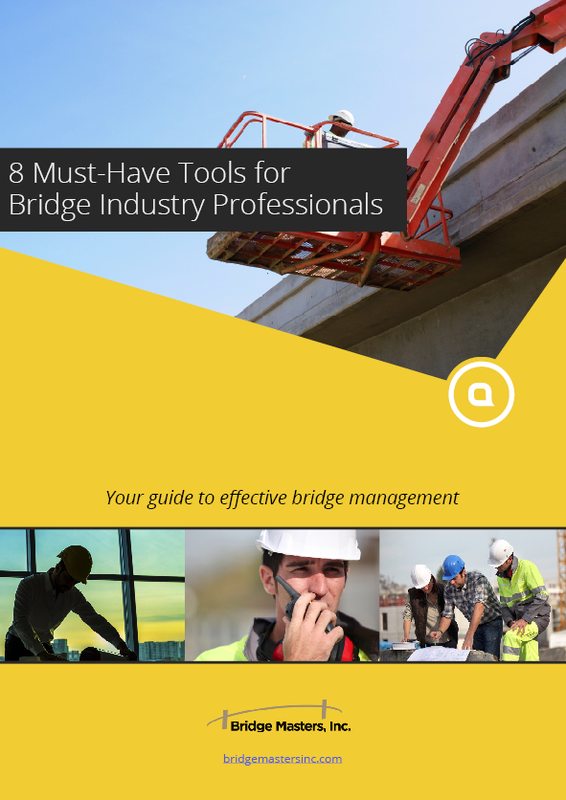 Do you have the resources needed to keep bridges structurally sound? If the answer is “No,” it could be time to partner with government agencies, public advocacy groups, and private entities to find the budget dollars needed to keep people safe. Have you done everything possible to prevent accidents? Computerized signage, automated warning systems, and advanced communications technology are relatively low-cost investments that can help prevent accidents that can trigger bridge failures. The Morandi Bridge collapse was a tragic event. The best thing that can come from it is using the signals that pointed to its failure to prevent future calamities.